Today, I’m going to share the top 10 MLM Companies in Canada, as I see it. 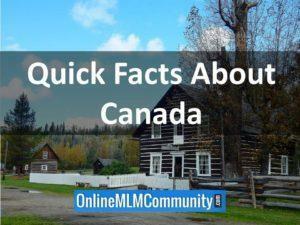 Many Canadian citizens have discovered that operating a home-based MLM business can be a great way to become financially free. And while many assume that the top MLM Companies in Canada would mirror the top MLM Companies in the United States, I am here to tell you that is not true. I have done some extensive research to find the top 10 MLM Companies in Canada, and I am going to share my findings with you today. I will start at #10 and take you up to the #1 MLM Company in Canada. Canada’s name comes from the Indian term Kanata meaning village. The country has the world’s longest coastline at 125,566 miles. Canada’s lowest recorded temperature was -81.4 degrees Fahrenheit (-63 C) in 1947. Police Departments in Canada give out “positive tickets” when they see people doing something positive. Canada consumes the most doughnuts and has the most doughnut shops per capita of any country in the world. The North American Beaver is the national animal of Canada. 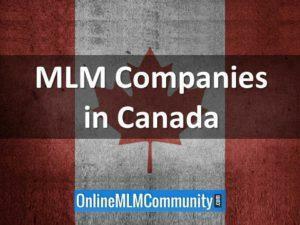 Now, let’s look at the top 10 MLM Companies in Canada. Founded in 2002 by Jim Coover, John Anderson and Kathy Coover, Isagenix is based in Gilbert, Arizona. Isagenix has spread somewhat internationally, and Canada has a love for the Isagenix dietary supplements and other personal care products. Here are a few quick facts about Isagenix. The Isagenix product line includes weight loss, well-being, performance, essential oils and personal care items. The company’s most popular products are: Weight Loss BasicPak, Isabiome, and e+™. Some awards Isagenix has earned include Inc. 5000 Fastest Growing Companies, The American Business Awards, and Direct Selling Association Top 20. Melaleuca is a MLM Company that manufactures and sells a large variety of products, but with a focus in health and wellness. Melaleuca was started in 1985 by Frank Vandersloot. The company is based in Idaho Falls, Idaho. Melaleuca has many independent representatives in Canada and other countries around the world. Here are some other neat facts about Melaleuca. Melaleuca’s most popular products are: Peak Performance Total Longevity 50+ Supplements, Renew Skin Therapy, Safe & Mighty Toilet Bowl Cleaner, and New MelaBrite Plus Oxi. Some awards the company has earned include 500 Hall of Fame, Idaho’s Business Leader of the Year, and Entrepreneur of the Year by Ernst & Young, CNN, and USA Today. Pampered Chef has gained a lot of popularity in Canada. This direct sales company was started in the basement of a home in Chicago in 1980. Doris Christopher started selling cookware, cookbooks and other kitchenware. This business is promoted through the party plan. Pampered Chef became so popular that in 2002 Berkshire Hathaway acquired the company. Here are a couple of additional cool things about Pampered Chef. The company is company’s headquarters is in Addison, Illinois. The company’s product lines include: home care, kitchen products, and cook books. Scentsy is a candle warmer MLM business that is promoted through the party plan. Scentsy has become quite popular in Canada. The company was started in 2003 by two women. In 2004, Orville Thompson bought Scentsy. The Scentsy headquarters are in Meridian, Idaho. The Scentsy product line includes: home care, personal care and essential oils. Some awards Scentsy has earned include #35-Forbes America’s Best Mid-size Employers 2018, 2018 Direct Selling Best Places to Work, and 2017 DSA Ethos Awards. Herbalife is huge worldwide and Canada is one of the locations it has grown substantially. 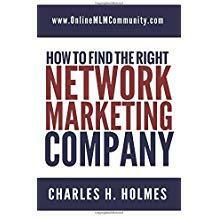 Mark Hughes founded this weight loss and dietary supplement MLM Company in 1980. Based in Los Angeles, Herbalife has its share of critics, but continues to have strong growth year-after-year. Herbalife aims to Make the World Healthier and Happier. Some awards the company has earned include the 2010 Apple Award and 2009 Supply Chain Distinction Awards. Headquartered in Provo, Utah, NuSkin manufactures and sells dietary supplements, skin care products, and personal care products. The company was founded in 1984 and has achieved phenomenal growth internationally. Canada has been accepting of the Nu Skin plan and you can find home-based Nu Skin business owners throughout Canada. Nu Skin‘s most popular products are: ageLOC Transformation Set, Tru Face essence ULTRA, Celltrex CoQ10 Complete, Celltrex Ultra Recovery Fluid, and Glacial Marine Mud. Nu Skin is a premier anti-aging company committed to providing quality skincare and nutrition products. Mary Kay and the great line of cosmetics are very popular in Canada. Yes, you will see independent Mary Kay representatives driving their pink cars around the country. Mary Kay was started by Mary Kay Ash back in 1963. The company is based in Dallas, Texas and is a well-known name all around the world. The company’s most popular products are: Oil-Free Eye Makeup Remover, Foundation Primer Sunscreen SPF 15, Ultimate Mascara™, TimeWise Repair® and Volu-Firm® Day Cream With SPF 30. Some awards the company has earned include Best Advance in Learning Management Technology for External Training, Best Company of the Year 2018. Mary Kay is a top beauty brand and direct seller in nearly 40 countries around the world. Just a few years ago, the MLM giant Amway held the #1 spot in Canada. But times have changed and they have dropped to #3 (in my opinion). Amway offers a huge range of products from nutritional supplements to water conditioners, and a lot more. Founded in 1959 by Jay Van Andel and Richard DeVos, Amway is headquartered in Ada, Michigan, not far from the Canadian border. Oh how that jingle from years ago still rings in my head. Yes, Avon is even more popular in Canada than in the United States it seems. With a wide range of products with a focus on personal care, Avon started way back in 1886 by David McConnell and is now headquartered in London. Doing more than $9 BILLION per year in revenue, Avon is the largest MLM Company in the world. It goes back and forth each year with Amway for this spot. It may come as a surprise to you, but as I see it, Primerica is the top MLM Company in Canada. Offering various forms of insurance and other financial services, many Canadians have a strong home-based Primerica business. Primerica is based in Duluth, Georgia and was founded in 1977 by A.L. Williams. It is a unique service based MLM company that will be difficult to take out of #1 position in Canada. Some awards Primerica has earned include the Dalbar Mutual Fund Service Award 2018. Well, there is my opinion of the top 10 MLM Companies in Canada. Do you think I got it right? If not, who did I leave out? Post your comments and questions below. Also, if you live in Canada and would like to start a MLM home-based business, you may want to try any of these companies. Thanks for visiting and be sure to share this post with others. I’ve never heard of ACN before. Are they legitimate? What types of products and services do they provide? Please add few more details about this company. Thanks. ACN focuses on telecommunications, such as cell phones, home phones, home security, cable tv, internet services, utilities and much more. One thing I like about this company is that everyone you talk to is already paying for these services. You’re not asking them to create a new spending habit. All they need to do is switch over and make money from it. Can I make Qnet business in Canada? To the best of my knowledge, QNET does not do business in Canada. If you want to expand it to Canada, I would contact the corporate office and learn what the process is. Hi, pampered chef is not available in Quebec… Just a lil side note. Thanks for letting us know. Much appreciated Russell. Thank you for this. Interesting. Can you tell me how ACN is doing in Canada and the US. What do you know about ACN? I have several friends who do very well in ACN. It is definitely alive and strong in both countries.